There should be government interventions insomuch that the government helps fix market inefficiencies so that the health care system can in the future be semi-autonomous. The worry of inefficiency is well grounded in the fact that the system is absurdly expensive compared to other developed countries. Nearly 18% of GDP ($2.5 trillion) is contributed by the health care sector – the highest percentage in the developed world. If we compare percentage of GDP per capita, the number of the US doubles that of any developed country. Three market players brought such inefficiency: patients as consumers, insurers as intermediaries, and physicians as providers. Each category with its distinctive features has given birth to different types of inefficiency in the health care system. Indeed, under the veil of ignorance regarding their future demand for health goods, people can reach a higher expected utility level without buying insurance. This is especially true for the poor who get paid by the government when sick, because it lowers their income in the state of health without increasing their income in the state of sickness. They are free riding the whole system in the sense that they are using health care without paying because they know government and taxpayers will pay for it anyway. According to a report last year, people who are uninsured consume about half as much health care as those insured. Each uninsured person contributes about $1,500 per year to the health care system and leaves about half of that cost as bad debt – a huge burden on the health care system. Even people who pay insurance premiums for health care cannot be completely ruled out as free riders. At least they are over-consuming health care, just like customers do in a buffet – you have to “win” back all your money by eating as much as you can, which is often beyond your real need. Moral hazard is another problem related to unnecessary health care. It is a term used when an individual is willing to take more risks because the cost of his or her action will be covered by health insurance. For instance, smoking is a major causative factor in many illnesses including lung cancer, cardiovascular disease, peripheral vascular disease, strokes, and COPD that will cost a lot for treatment. Yet smokers are not subject to higher premiums in Medicare and many insurance plans. Other harmful behaviors include alcohol or drug abuse, motorcycle riding, and even unhealthy daily habits that leads to obesity. Proper government intervention, however, can control free rider problems, overconsumption, and moral hazard, by putting limits on insurance coverage. More importantly, it can help to build a mechanism that internalizes social costs and sets the right incentives for health care consumers. Insurance works as a risk-pooling mechanism in which people pay a small amount of premium in order to receive benefits when adverse events happen during insurance’s term. When insurers know loss probabilities and premiums are actuarially fair (premium equals expected loss), all risk types will opt in for full insurance at different premiums. However in real life, the actual loss probability is either unattainable or cannot be incorporated into insurance contracts. Consumers can take advantage of their better knowledge on their own health to adverse select insurance contracts to their benefits. With the presence of risk selection, high risks are more likely to be offered a less attractive contract, while low risks are more likely to shop around and switch insurers. The effects of this are two-fold. Many high risks end up uninsured while commercial insurers end up with more high risks under their coverage so they have to increase premium or file for bankruptcy. Both have negative effects on social efficiency and shake the insurance market stabilization. Government intervention can reduce the incentive of risk selection by prohibiting selection methods such as selling supplementary benefits or offering outright payment to attractive risks or, though not quite enforceable, requires the specification of the benefit package. Lower risk selection provides a possible way to stabilize health insurance market by reducing incentives for low risks to shop around and change insurers. Physicians are always regarded as gatekeepers to the health care system. However, their dual role in relation to their patients puts their efficiency in suspicion. They are providers of medical services as well as advisors concerning it. Demand for medical service is supplier-induced and that is the reason why no trend of underemployment has ever occurred even when the number of Medical School graduates and physicians in the market keeps growing for years. Two conditions that facilitate the effect of supplier-induced demand are comprehensive health insurance and riskless medical technology. When people are under comprehensive health insurance, their own willingness-to-pay becomes irrelevant on their medical service demand, thus causing the medical demand to be completely supplier-induced. Riskless medical technology means little marginal cost to physicians. For example, physicians have more incentive to provide some diagnostic procedures to exclude the existence of a concomitant disease saucing the same symptoms. The problem is that what seems to be of no cost to physicians is actually a huge cost to society. Lack of transparency due to information asymmetry and market power explains a great deal of the absurdly huge medical cost in US. The lack of transparency is not just for major medical procedures like cancer treatments or heart bypass surgery, but also for everything in doctor’s offices everywhere. 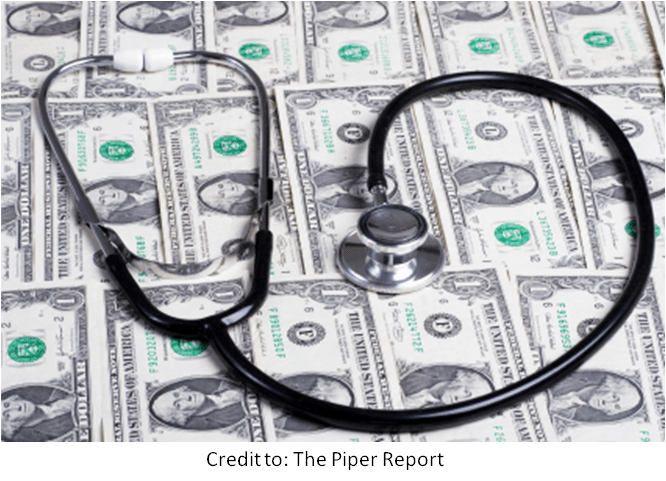 In a report earlier this year, Forbes gave out some data depicting how lack of transparency increases medical costs without increasing quality. “Imagine if you fell off your bike and had a head injury such that your doctor ordered some tests…For a CT scan of the head, the prices vary from $240 to $1421.63; for an MRI of the brain, the price varies from $625 to $3316…If you were on Medicare, the price would be set at the low end of this range. If you were not, you and your employer could very easily be stuck with a much higher bill for a test run on an identical machine and in many cases reviewed by the same radiologist.” Moreover, “In 49 major metro areas, CT scan prices vary by more than 500 percent; cost of a simple cholesterol panel on a blood sample varies by 474 percent in the median major metropolitan area in the U.S; cost for a screening mammogram can by over 350 percent.” However, the quality is pretty much the same. Supplier-Induced demand is somewhat harder to solve since it requires expertise that most people don’t have and it’s largely a case-by-case problem. However, government intervention is able to make pricing in heath care more transparent, so that patients and their employers have a chance to compare the prices and qualities between providers. The benefits are twofold, on the one hand, consumers are able to choose the right product and service that fits their needs, and on the other hand, suppliers are pressured by competition to improve their quality and decrease their costs. Characteristics of different market players in the health care system suggest that government intervention is necessary for correcting market incentives and optimizing social efficiency. However, more criteria should be met to insure a more effective government intervention. Equity is one of the extra concerns. For example, compulsory insurance is a solution proposed, but it is essentially an unfair wealth redistribution that hurts healthy young workforces by imposing more financial burden on them without necessarily increasing overall health care quality. Efficiency of health care regulation itself is also important. The complexities of the health care system and regulation, though might have created jobs, brings many costs and burdens. Maybe now is a good time to simplify the health care system instead of putting more complicated rules on it. Government has the responsibility to fix market inefficiency but should do it only in a way that boosts the free market instead of hampering it. Although health care has characteristics that deviates it from functioning free market like, there is the possibility to change this by setting up a right incentive mechanism for consumers, intermediaries, and providers; and this is the job government should take.